Scientists have been searching for extraterrestrial life for some time now, and various individuals and organizations have made different predictions regarding when we might actually find something: in the next century, by 2040, right now. It’s incredibly difficult to believe that humans are the only intelligent (your mileage may vary when it comes to the usage of that term) life forms in the infinite universe, but finding the others is another matter entirely. The Fermi Paradox teases out this line of thought: given how likely it is that life does exist somewhere out there, how come we haven’t been able to gather any actual evidence of it? Why aren’t aliens making contact with us? Is it because we’re too stupid, as Neil deGrasse Tyson suggests, or because of the sheer distances that separate us from our galactic neighbors? Whatever the answer, you can rest assured that scientists won’t stop looking for alien life, and one possible way of doing so is by sniffing out the unique chemicals that comprise the atmospheres of inhabited planets. A planet’s biosignature is anything that indicates the existence of life on that planet—it might be chemical, molecular, waste-related. Basically, anything that points to life that could conceivably be observed in a planet’s atmosphere. Elements such as oxygen and methane, both of which are part of Earth’s biosignature, indicate the presence of life, but the complicated part is that they might also simply indicate something natural and geological about the planet. Some gases and chemicals occur naturally as well as biologically, although scientists believe that if they were to detect both oxygen and methane in a planet’s atmosphere it would be a good start to finding alien life because they “destroy” each other. The presence of both would mean that some life form is introducing methane into an oxygen-rich atmosphere, just as humans (and animals and bacteria) are. Sulfuric chemicals and pollutants such as cholorfluorocarbons could also indicate life—that is, unless aliens are so intelligent that they’ve found a way to either mask their planets’ biosignatures or not produce any waste at all. Scientists can use a telescope to try and identify and observe a planet’s biosignature, but NASA scientist Shawn Domagal-Goldman says, “I joke often that maybe you want to smell for life on other planets instead of look for it with a telescope.” Many of these chemicals and biosignatures would have a distinct odor identifiable by the right equipment. 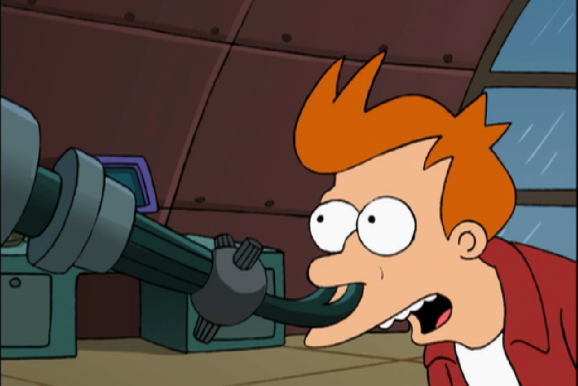 It turns out that Professor Hubert Farnsworth from Futurama had a pretty brilliant idea with his “smell-o-scope,” and now scientists are considering using a conceptually similar device to sniff out aliens. Of course, that presumes that we know what smells to look for.